In 1997 Sansriti organized seminar on ‘Conventional Education & Children’s Theatre’ at Girish Mancha. In 2001 Sansriti organized seminar on ‘Usha Face To Face’ at Bangla Academy. In the same year another seminar on ‘Time Organisation Theatre’ was also organized at Bangla Academy. In 2002 Sansriti and Paschimbanga Nastya Academy jointly arranged a seminar, topic was ‘Birth Centennary of Satu Sen’. In 2003 a seminar on 'Winkle Twinkle' was organished by Sansriti. In 2004 Sansriti organished seminar on ‘History of Indian Theatre’. In 2008 a seminar was organized on ‘Economics & Contemporary Theatre’. 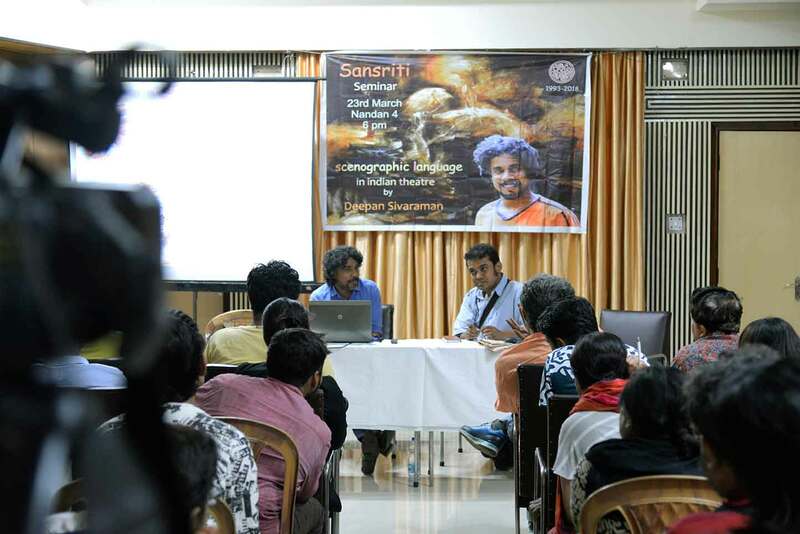 In 2010 Sansriti conducted seminar on ‘Neuroscience & Theatre’ at Bangur Rehearsal Room. In 2011, ‘Sohinir Mukhomukhi’ was arranged at Tripti Mitra Sabhaghar. In 2012 an event was organized on ‘Usha Gangully’ at Natya Academy Tripti Mitra Sabhaghar. In 2013 a seminar was organized by Sansriti on ‘In Search of New Theatrical Language’ at Bangla Academy. Speakers: Sujan Mukhopadhyay, Sudipta Chakrabarty, Dron Acharyay and Ambarish Bhattacharyay. In 2014 a seminar on 'Mahabharata and Folk Tales' was held at Bangla Academy. In 2015 an event, named 'Why do I act' was organized at Bangla Academy. In 2016 arranged the event ‘Amar Natyadarshan’ at Bangla Academy. In 2017 Sansriti organized a seminar on ‘Bhoroter Natyasastra’ at Bangla Academy. In 2018 a seminar was arranged on ‘Scenographic Language in Indian Theatre’ at Nandan 4. Moderator: Anshuman Bhowmick & Dr.Asish Goswami.